“3 key intellectual-activists - al-Banna, Mawdudi, and Sayyid Qutb - have been so influential in creating the vision of modern Islamic reform... It is almost impossible to exaggerate the direct and indirect impact and influence of these three men. Their writings have been published and distributed throughout the Muslim world. Their ideas have been disseminated in short pamphlets and audiocassettes. The leadership of most major Islamic movements, mainstream and extremist, nonviolent and violent alike, has been influenced by their ideas on Islam, Islamic revolution, jihad, and modern Western society.” ( ¹ John Esposito, Unholy War). • To see thru this worldwide deception, AKA stealth jihad, you have to understand a major force behind it - the Muslim Brotherhood. And to understand the Brotherhood, who many Experts™ claim have Moderated™ and Renounced™ violence, you have to understand what these 3 ideologues wanted to see what supposedly Moderated™. Esposito is right, it’s almost impossible to exaggerate their influence. When they wrote, the umma was without a caliphate for the first time since Mohammad’s days. The Ottoman Empire was gone, Turkey was born in 1923. 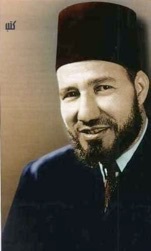 1) Imam Hassan al-Banna (1906-1949) - Sufi, Egyptian Sunni revivalist, founded the Muslim Brotherhood in 1928 in response to the end of the 600 year old Islamic Ottoman Empire. His goal was a new Islamic empire, AKA caliphate. Graduated Dar al-'Ulum college, Cairo. Most influenced by Rashid Rida (1865-1935), but also studied Muhammad Abduh (1849-1905) and Jamal al-Din al-Afghani (1839-1897), known as the founders of the Salafiyya. Assassinated in 1949 probably in retaliation for the Egyptian PM’s assassination, he is remembered as a martyr. “Allah is our objective. The Prophet is our Leader. The Quran is our Constitution. Jihad is our way. Dying in the way of Allah is our highest hope.” More Al-Banna quotes. 2) Sayyid Abul A'la (Maulana) Maududi (1903-1979) - Indian Sunni revivalist, profoundly influenced by Hassan al-Banna, and a friend and reader of Sayyid Qutb,1 who he also influenced.2 In 1941 Maududi created a sister movement of the Muslim Brotherhood, the Jamaat-e-Islami (JI) in Lahore, Pakistan, then part of British India. He was elected 1st President of JI,3 and remained so until 1972. JI is now the largest Islamic political party in Pakistan, and it established the Taliban.4 He died in 1979 in Buffalo, New York, and his funeral in Lahore drew a crowd of over a million. A prolific writer, he wrote The Meaning of the Qur’an, widely used today, six volumes, 700 page each. He also wrote Jihad in Islam, both are found in American mosques. Here are 36 books of his online, all presently banned in Bangladesh, where JI leaders are suspected of participating in killing as many as 3 million mostly Hindu people in 1971 while he was president of JI Pakistan. His books are often promoted by American Muslim groups, including the Islamic Circle of North America (ICNA), and the Muslim Student Association, who had his book posted, but remodeled their website, now it’s gone. 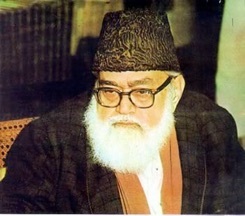 “The purpose for which the Muslims are required to fight is not, as one might think, to compel the unbelievers into embracing Islam, rather, its purpose is to put an end to the suzerainty to the rule of the unbelievers so that the latter are unable to rule over people.” Towards Understanding the Qur'an More Maududi quotes. 3) Sayyid Qutb (1906-1966) - Egyptian Sunni revivalist, Islamic scholar, attended and taught at Dar al-'Ulum, memorized the Koran by 10, described by his (Arab) biographer as "the most famous personality of the Muslim world in the second half of the 20th century," often called the chief ideologue for the Muslim Brotherhood, was influenced by his friend Maududi. Went to the USA in 1948 where many things about American culture offended him - its secularism and decadence for example.1 In 1951 he returned to Egypt, joined the MB, and soon becoming its leading theorist in the 50’s and 60‘s, spending many years in prison, executed in 1966, and remembered as a martyr. Wrote Milestones (1964), which is found in American mosques, and Ibn Warraq says it is one of “4 core texts of jihadists” today. While in prison he finished his massive 18 volume In the Shade of the Qur’an. The free on line version of that book includes a book review by U.S. born Imam Anwar al-Awlaki, who was killed September 2011 by a US drone missile in Yemen, which exposes the deception of Imam al-Awlaki who was previously hailed in the NY Times in October 2001 as one of “a new generation of Muslim leader capable of merging East and West”, then led Muslim prayers on Capitol Hill in 2002. His importance is impossible to exaggerate. Sayyid Qutb quotes. • We are more or less told that the defeatists have somehow peacefully taken over the Brotherhood and Moderated™ it with what Qutb called jahiliyyahh (ignorance). Do you think that’s likely for a group that survived its headquarters burned down and 15,000 arrested with some executed in the 50‘s crackdown, whose leaders al-Banna and Qutb were martyred, and whose motto the new Brotherhood President of Egypt said still includes “Jihad is our way. Dying in the way of Allah is our highest hope”? Another massive crackdown happened in 2014, with President Morsi and many other arrested after the Brotherhood showed the world they have not moderated at all. 529 of them were sentenced to death.